Long gone are the days when you could just get the local handyman to string up a few lights around the pitch and cheer on the game! The modern game of football now places demands on the players which mean good vision is essential. 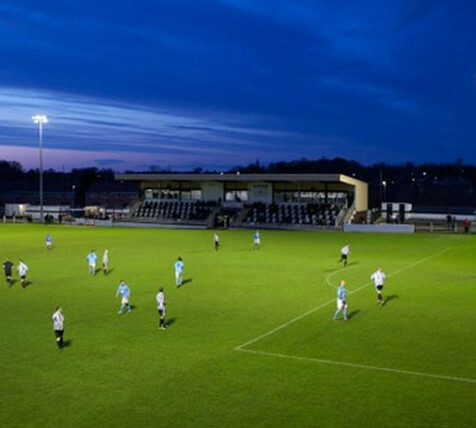 In order to achieve consistency throughout the leagues there are then standards to ensure football pitches have good effective lighting which is not only bright, but also evenly spread across the pitch. 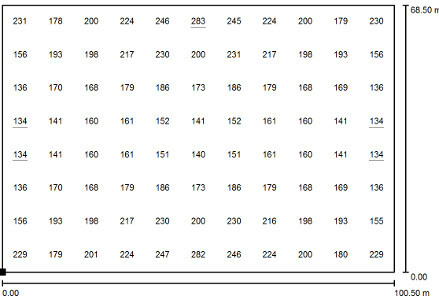 The average LUX level needed on the pitch is dependent on the league and the FA provide the following guidelines. 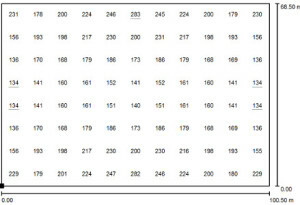 These levels are minimum levels measured as an average across a grid matrix on the pitch with 88 points , 11 along the length and 8 across the width. The other requirement is for a consistency of lighting level to ensure that there are no dark spots and this standard demands that the highest measured LUX level must not be more than 4 times the lowest measured value. These standards, whilst being excellent for the game, do place high demands on the lighting design and the sophistication of the lighting solution. With these exacting standards clearly you cannot just put up some posts and flood lights and try it out. If you were to go down this route it would require a massive amount of iteration trying many floodlight combinations with different beam angles and positions to meet the standard required. Accordingly the best method is to perform a lighting simulation and I will present some examples here from one SLB have performed for a football club. 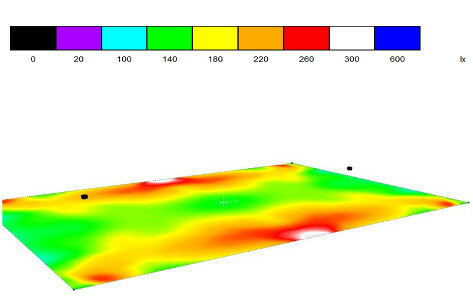 From this base column layout the simulation then allowed us to select different floodlights and then, through using industry standard IES files, predict the LUX level at every point on the football pitch. 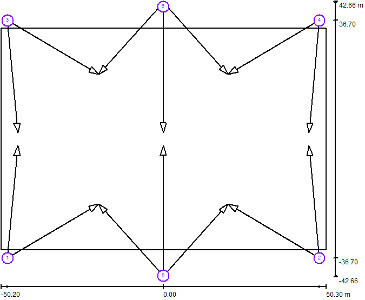 Accordingly this configuration was them optimised to produce good light levels across the pitch and the following measured grid simulation was produced. Then as a byproduct of the simulation it is possible to calculate a rendering across the pitch to give a visual interpretation of the LUX levels across the pitch as shown below. 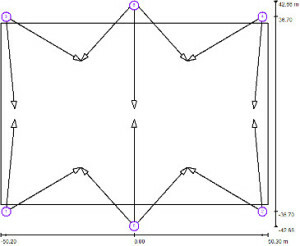 As I am sure you can see that this ability to simulate is fundamental in the lighting design process and it means that a truly optimal solution can be derived which even takes into account the inevitable light depreciation over time that is caused by the degrading of the lamps. The Choice between Metal Halide and LED Floodlights. LED floodlights have a number or significant advantages for example they are twice as efficient. They also come on instantly and have a typical life of 50000 hours against around 12000 hours for metal halide floodlights. 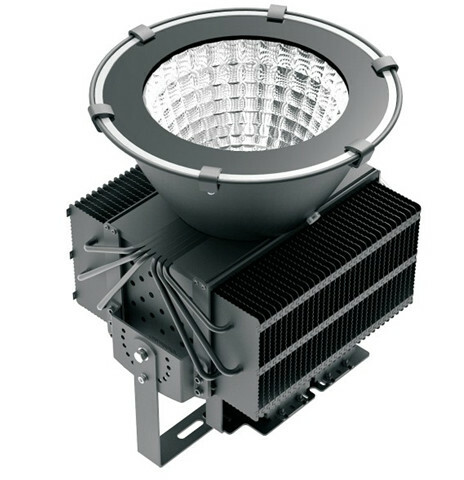 However there are a number of advantages of metal halide floodlights. 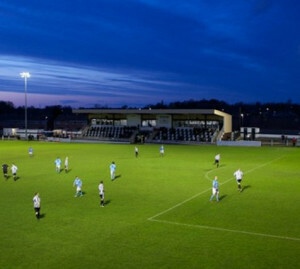 As the design of these floodlights has been developed over many years then the design has been refined to minimise light spillage and just focus light on the pitch itself. 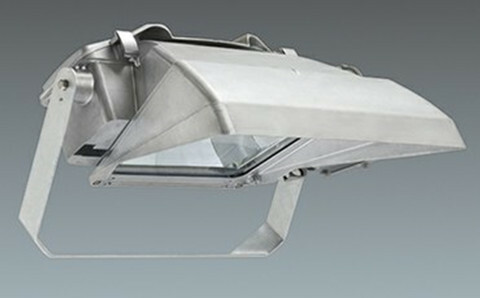 This can be seen in the design of this leading example which is the Thorn Champion floodlight which is used at Wembley stadium. 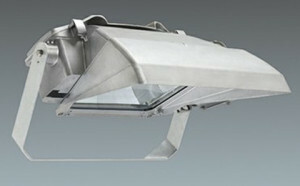 The alternative is the LED floodlight which does not have the top cover design as pictured here. The other issue with the LED solution is that it is far more expensive from an investment cost perspective and consequently far more floods are needed. By example this LED floodlight will produce an impressive 92000 lumens from a 800w unit and the 2000w metal halide floodlight produces 225000 lumens when new. This means that the pitch can be lit, to meet the 180 LUX standard, with 14 metal halide floodlights but would need 24 of the LED floodlights. I trust you can see that the decision is not simple and the simulation and cost analysis are important tools for the decision analysis. Thorn only supply through their registered dealers. The easiest way to find them is to go onto their website, go to contact us and find a supplier. Call them up and best of luck. If you want to change them to LEDs we can help but not with the supply on metal halide parts.